NATO is not seen as the main military threat in the Russian military doctrine, but Moscow is concerned that the Alliance keeps approaching the Russian borders, President Dmitry Medvedev has said. "It is not NATO that is an issue. 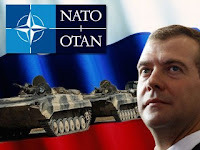 NATO is not seen as the main military threat [to Russia] in the military doctrine," Medvedev said in an interview with the French magazine Paris Match. Medvedev gave a negative answer when asked whether the new Russian military doctrine is a rollback to the Cold War era. "No, I don't think so," he said. "The issue is that NATO's relentless enlargement by taking in countries that were once part of the Soviet Union, or are our nearest neighbors, is creating certain problems, because NATO is a military block after all," he said. "We have our own defense strategy and our own armed forces, which are intended for a definite configuration. But if a military bloc, with which we maintain partnership relations in general, keeps approaching our borders all the time, if a reconfiguration of missiles is taking place, or other things are happening, we cannot stay indifferent, of course," Medvedev said. "This is an absolutely open and correct position and it does not mean we are returning to the Cold War era. We just must take this into account," the Russian president said.